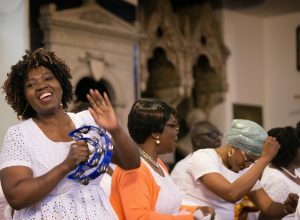 Harriet Appiah-Anderson (left) sings with the choir at Wesley’s Chapel in London. She is chair of the church’s Ghanaian fellowship. Photo by Mike DuBose, UMNS. With John Wesley’s study chair, Charles Wesley’s organ, and the Museum of Methodism on-site, it would be possible to conclude that Wesley’s Chapel & Leysian Mission in London is stuck in time – the late 18th century, to be exact. That is not the case. While still welcoming visitors who want to see the church that Wesley – the founder of Methodism – built, the current congregation is firmly focused on the denomination’s presence in the community and contributions to global Methodism today. Identity is important, says the Rev. Jennifer Smith, the superintendent minister of Wesley’s Chapel. Smith added that there are riches to conserve and pass along to younger generations. Wesley’s heritage also is reflected in the national flags which ring the sanctuary’s balcony, representing the diverse congregation. The upwards to 500 members include British citizens of African descent — representing Ghana, Nigeria, Sierra Leone, Gambia, Zimbabwe, South Africa, and Cote d’Ivoire — as well as Methodists from Fiji, Tonga, Hong Kong, China, Japan, South Korea, the Philippines, the U.S., Latin America, and Europe. “The worldwide relationships of this church are alive again and fruitful and they’re not just about its being a place of pilgrimage,” Smith said. Much of the growth comes through the fellowship groups, which are restricted to congregation members. The groups direct those who wish to join them to church membership courses. It’s the devotion to Methodism that holds such a culturally diverse congregation together. “We can fall out from time to time, but it’s amazingly harmonious,” Atkins said. 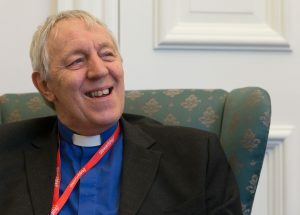 He is well aware that this influx of global Methodists at Westminster is what makes the difference, both in size and vitality. “If London was not a global city, profoundly renewed and resourced by immigration, by people who are devout Christians … this church would have about 55 members,” he pointed out. Close a church, open a ministry? While there is no quick fix for the British church’s deep membership decline, Atkins knows what does not work. 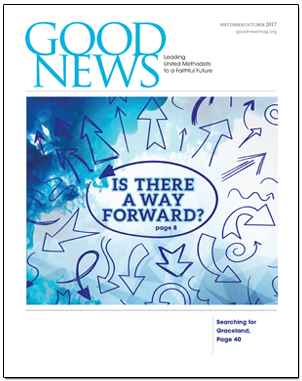 “We mustn’t be naive enough to think that success for the British Methodist Church lies in how many old chapels you can keep up,” said Atkins, who has spent a number of years looking for ways to attract new disciples through the church’s “Fresh Expressions” program. British Methodism had more than 600,000 members in 1980. But that number had dropped to 188,000 worshipping in 4,512 local churches in the Statistics for Mission report submitted to 2017 Methodist Conference, with most members at retirement age. It’s time to take radical steps to change the culture. That’s the call that the Rev. Loraine Mellor, the Methodist Conference president for 2017-18, has taken up as she has encouraged all local congregations to take a good look at themselves. “She’s taken this thing just a little bit further and a little bit sharper by banging the drum, if you like, about choosing death or life,” explained Atkins, who called Mellor a great friend and straight-talking evangelical. Describing British Methodism “at a crisis” but not yet “at the tipping point,” Mellor said that when she visits Methodist congregations she challenges them about their mission in three areas — worship, hospitality, and disciple-making. Worship must be God-focused and compelling enough to encourage people to go out as missioners and evangelists. Hospitality means helping visitors encounter God as well as enjoy community activities in church buildings throughout the week. Most important, Mellor says, is a commitment to intentional disciple-making. “If we’re not making disciples, then we’re a club, not a church,” she said. Linda Bloom is assistant news editor of United Methodist News Service. This is adapted from her special UMNS report on British Methodism.